Looking for a simple solution to keep your dog in one position while driving? With the new laws requiring your dog to be restrained at all times, here's a great soluton. 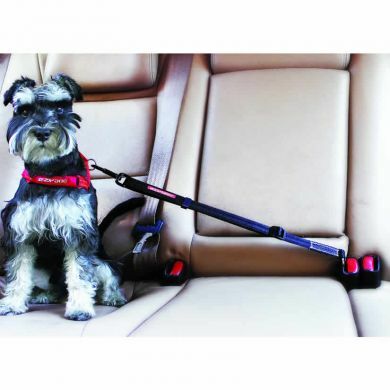 Ezydog's Click Adjustable Car Restraint has been designed to prevent driver distraction as well as passenger interference while on the road. into the existing seat belt clip of your car. Being highly adjustable makes it suitable for different size dogs and allows flexibility for movement in the car. Works with most modern cars. Not suitable for Volvos. Read 40 customer reviews of EzyDog Click Adjustable Car Restraint. The average customer rating is 4.7. Amazing product. It gives my dog room to move whilst still being safe. We used to put the seat belt through the harness and it gave him skin tags. This has made Chester's (our French Bulldog) experience in the car much more enjoyable which also makes it less stressfull for us! This restraint is of high quality and is brilliant for the car. The longer restraint allows our dog to move i to a more comfortable podition when travelling. Very quick and easy to use! Keeps Indy safely in the back seat...still has enough movement to look out the window but stops her from jumping into the front seat. 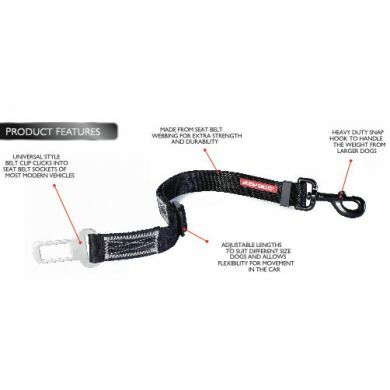 I just purchased adjustable car restraint and it is really amazing it fits to your car seat belt with easy very comfortable for your dog and I will be purchasing another in the near future . 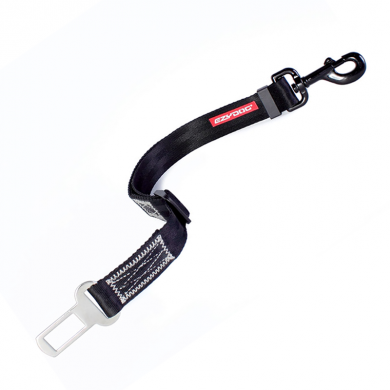 The car restraint is well constructed, strong yet simple to adjust. 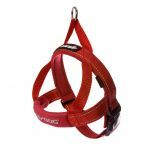 We currently use it to attach to the rear clip loop on the Ruffwear Front Range Harness to secure the dogs in the car which works very well. A worthwhile investment. I would have rated this product quite highly. It is very handy, easy to use, and our dog travelled in the car around 5 times without incident. On the last trip, however, our 4 month old Beagle chewed straight through it. Maybe wrong product for our dog. 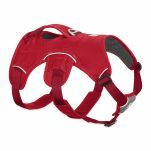 Easy to use, bought with the Ruffwear Web Master Harness. Both products exceptional quality. Would definitely recommend.